Photo from Explosion of Ungovernable Rage show in Santa Rosa, 2010. Photo from Karen Marcelo. 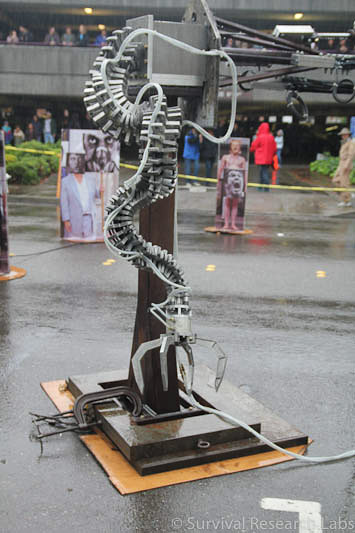 SRL Spine Robot. This arm is intended as a prototype for a family of fast moving robot arms for SRL show use. It is being manufactured largely by CNC machines at the SRL facility. It is not intended to have any practical use whatsoever. Made up of 52 segments at this point. Will probably end up at 60 segments. Total length when the socket joints are included is 9 ft. Total length when done will be 12 ft including tip segment. Segments range in size from 9² across for segment #1 to 5² across for segment #52. Shrinkage factor of .9907 per segment. Each segment has 8 degrees of freedom of movement, giving the arm a total angular range of 480 degrees. Each segment has a concave socket machined into it that contacts a convex hemisphere of Delrin that is bolted into the adjacent Segment. Tendon material is 3/8 Superline XD, a Heatreated and prestretched Dyneema 75 rope with an abrasive resistant covering. Breaking strength is 26500 lb. This rope is rated for over 200000 cycles at 80% load. It is 1/8 the weight of steel cable. The tendon material will be anchored using epoxy potting compound in tapered stainless socket threaded terminations. Four tendons, actuated by hydraulic cylinders, generate movement. A fifth tendon runs down the centerline and is spring loaded with a heavy spring. The hydraulic system is controlled by an operator using a Hetronic Proportional Radio remote control. This hydraulic unit was removed from an armored personnel carrier where it was being used for remote bomb deactivation in Iraq. Later versions will use servo actuators or servo hydraulics. Alloy is Aluminum 6061 T6 first 25 segments are .75² thick. Remaining are .625² thick. The four tendon bushings are made of .75² OD titanium alloy.